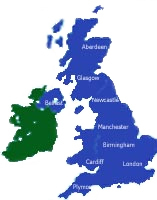 We cover the whole of the UK including London Manchester Leeds and Birmingham and offer the same service nationwide. We can also collect and deliver throughout the UK via our professional nework of nationwide couriers. We also run back to London on a regular basis. The time of this vehicles run is usually around 8am but the days vary. Dedicated couriers available 24hrs a day, 7 days a week. All vehicles have goods in transit insurance and come with very knowledgeable and courteous drivers. We are ready to carry out all your London Same Day Courier work.